As of the first quarter of 2013, in Massachusetts alone, there were over 2,000 solar power installations which made up for some 243 megawatts (MW) of electricity produced within the state. 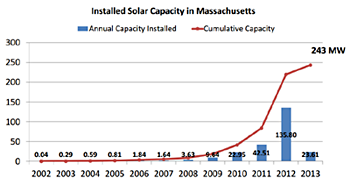 Click here for more MA solar energy facts. The main reason why there are so many solar power installations is because of the Commonwealth Solar Rebate Program set up by the state government. The Commonwealth Solar Rebate Program offers rebates for photovoltaics (solar panels) which in turn makes it much more affordable for many average homeowners to install them. The solar power rebate program began in 2007 with the goal of reaching 27 MW installed solar by the year 2010 with the aid of a $68 million budget. Further, a mandate issued in Boston set a target of 400 MW solar energy to be generated by the year 2020. In order for the 2020 target to be successfully achieved, an incentive funding mechanism was put in place named as a solar renewable energy credit (SREC). SRECs are in fact a type of renewable energy certificate which belong to those states that have Renewable Portfolio Standard (RPS) legislation in place. In addition to such state and federal incentives, those who own solar systems may recover their investment by selling SRECs either via spot market or long-term sales. The prices of SRECs are ultimately dictated by market forces. These market forces determined within parameters governed by the state. A shortage of SREC supply inevitably means a rise in pricing, which in turn increases the value of both the spot market and long-term market too. Aside from SRECs and rebates, another way of making solar energy more affordable is that of net metering. This is a policy whereby electricity consumers who own some form of renewable energy facility, in this case a solar power installation, pay a “net” rate for consumption. Net in this context actually means what is remaining after deductions. And in this case, the deductions are energy outflow against energy inflow, where the inflow is metered. A system owner within the net metering plan receives a certain retail credit for a proportion of the amount of electricity they are able to develop. Nevertheless, the utilities vary in how they work. For residents of Massachusetts under “Class 1” rules for solar power, extra energy generated is credited to their bill. Some utilities credit 1 kWh of solar power for 1 kWh of solar power, which means that the kWh is stored and can be used at night or perhaps at a later date in the year. Other utilities however are not quite as generous and may only offer a return of 0.9 kWh for 1 kWh used. There is another issue here however and that is the program is currently limited to only 1 percent of the utility’s full capacity. Obviously, at this time, solar energy is very low in comparison to other forms of energy used, but as it gains popularity, unless the capacity cap is raised, many residents will be unable to use net metering. Although currently we are discussing solar power rebate programs for the household, there is also a list of rebates available for industry – the Database of State Incentives for Renewables & Efficiency (DSIRE).